The announcement that Rex Tillerson had been fired by Donald Trump last week means the number of former department heads in his administration has now reached three (joining Tom Price of Health and Human Services and John Kelly of Homeland Security, who segued over to become the president’s chief of staff). Overall, Tillerson’s 424-day stint as Secretary of State (1 year, 2 months) through his last official day in office on March 31st ranks as the 17th shortest among the nearly six dozen men and women to head the department since the late 18th Century. But that fact does not capture how unusually short Tillerson’s tenure was and how quickly the relationship between Trump and Tillerson dissolved compared to past presidential administrations. Nearly each of the other 16 secretaries of state who recorded fewer days on the job were, unlike Tillerson, not the first secretary confirmed at the start of a presidential administration. Many of them began their duties later in the administration and served until the next president took office. In fact, only two presidents saw their first choice for Secretary of State serve for a shorter period than Tillerson – and one of those comes with an asterisk. In March 1869, Ulysses Grant selected nine-term Illinois U.S. Representative Elihu Washburne to head the State Department. However, Washburne took the position with the understanding he would simply be a placeholder until a replacement was confirmed – at which point he would become U.S. Minister to France. Secretary Washburne only had to wait until his 12th day on the job when former New York governor and congressman Hamilton Fish was sworn into office. Fish headed the department through the remainder of Grant’s eight years in office (as did Washburne in his new diplomatic position). That leaves one president’s first secretary of state who did exit his post early on poor terms like Tillerson. John Sherman was William McKinley’s secretary of state but he did not have as strong of a voice in foreign affairs as he had wished, and unsuccessfully opposed McKinley’s entry into the Spanish-American War. In late April 1898, after 418 days in office, Sherman resigned shortly after the war began. Tillerson’s firing came 12 days shy of that mark (406 days) and although he gave up his duties last Tuesday, Tillerson will technically still be in office through March 31st, thus outlasting Sherman on paper by six days. A few other presidents served alongside their first pick for secretary of state for short periods of time – but only because the presidents died early in their first term: Daniel Webster had 29 days on the job at the time of William Harrison’s death in 1841 while James Blaine had 200 days before Garfield died in 1881. In short, no other secretaries of state in U.S. history had a quicker falling out with their boss than Tillerson and Sherman among presidents who selected them in the first instance. The average tenure of a president serving alongside his first secretary of state is 3 years, 4 months, 8 days (including presidents who died in office) – or 2.9 times longer than Trump/Tillerson. Previous: How Often Do Parties Flip US House Seats in Specials Where They Previously Did Not Field a Candidate? 2 Comments on "Rex Tillerson’s Historically Short Tenure As Secretary of State"
1. 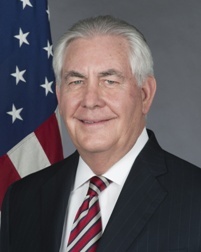 It is noteworthy, arguably unfair even, that John Sherman would end up with a shorter (official) tenure as a president’s first Secretary of State than Rex T, though he did not disparage his POTUS, either directly or indirectly (e.g. ‘“Effin Moron” or words to such effect) – or at least history does not record any missive of that kind directed towards McKinley. 2. Will Part Three of this occasional, unofficial series feature secretaries of veterans affairs (i.e. historically short tenures), or national security advisors? Or both? (Part 1 being HHS chiefs in early 10 of 2017) Looking forward to it!? VA Sec. Shulkin just passed James Peake (GW Bush’s final VA Sec.) at 398 days so he will not end up with the shortest tenure for that dept. 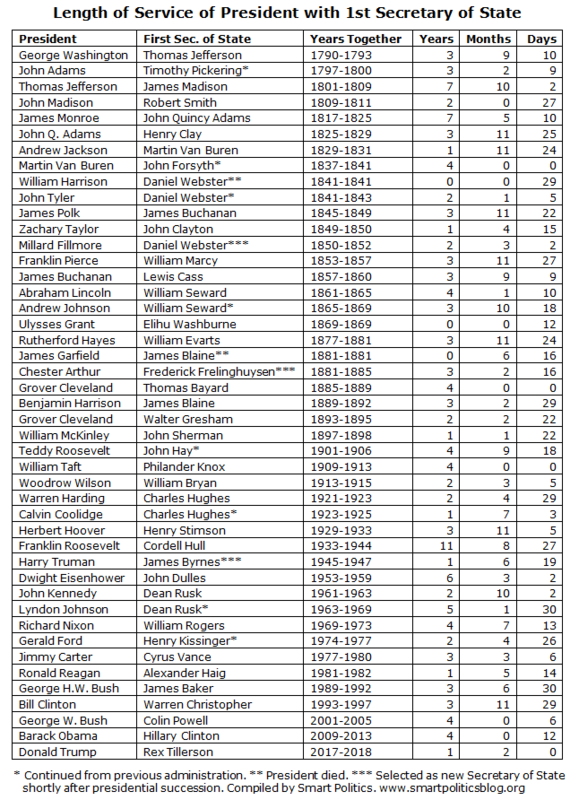 overall, but he will have the shortest tenure among for the 1st such secretaries of a pres. administration if he does not last another 2.5 years (granted, for only 5 presidents).